My gaming group’s used minis in our Dungeons & Dragons campaign for years, and when we playtested Star Wars we continued that tradition. I’m blessed with two players who have large collections of Star Wars minis that I can borrow and I’ve spent the last few days organizing them. One thing I’ve learned from my Mutants & Masterminds campaign is that it doesn’t do you any good to have a few hunderd superhero miniatures to pull from if you can’t find any thing. 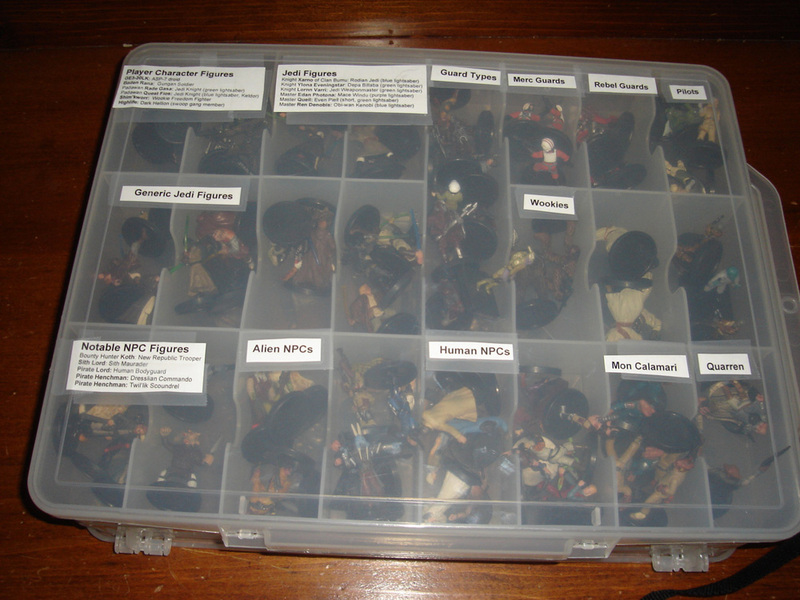 With that in mind, I took one of my miniatures cases for HeroClix (a plastic case originally designed for Matchbox cars) and re-tasked it for Star Wars. A wide-shot of my Star Wars mini case. Credit: Ken Newquist. I set aside all of the heroic player characters, and labeled their cells. I then broke out the important NPCs – such as the party’s Jedi instructors, ship’s captain, bounty hunters, and anyone else they’re likely going to run into more than once – into their own cells. I’m also sorting out figs that look like they’d make for good NPCs somewhere down the road (e.g. a certain pirate lord they’ll be fighting with eventually). Each group of cells gets a label identifying who is who for easy reference in game. Finally, I’m sorting out the commons into piles (e.g. battle droids, Rodians) and jotting down quick, generic labels so I can tell who is who at a glance. While I know that some people dislike miniatures, feeling that it detracts from the role of imagination at the table, I feel the opposite. For one, it helps everyone to know – definitively – where everyone else is, which in turn helps draw a mental picture of the scene (and helps frame said scene the same way in everyone’s minds). Moreover, having setting-specific minis (like the Star Wars ones) help’s reinforce that we’re not in Kansas any more. I’ve found sorting through the minis to be great idea fodder; I’m already got ideas for a droid mercenary band, a jet-pack wearing scoundrel, and a Rodian swoop gang/hunter pack.